Begin by writing the name and date of the tournament in the spaces provided. 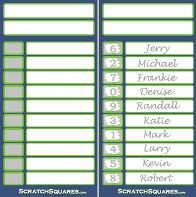 From there, have 10 participants or less write their name on the line or lines of their choice. 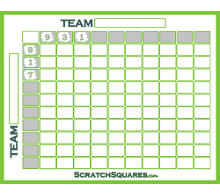 Once the lines are full, scratch off the covering to reveal the numbers. The numbers will represent the number of strokes over/under par the winner of the tournament is. If this number is in the double digits, the last digit will be used. 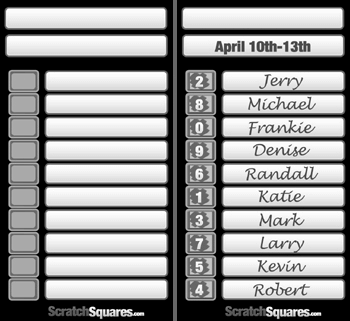 Example of a Winning Square: Tiger Woods wins the Masters with a score of -10, the person with their name beside the square with the number 0(last digit of 10) would be the winner. 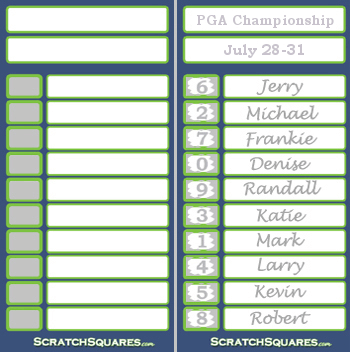 To have more than one winning square, you can also use the 2nd and 3rd place finisher's scores or even the leader's score after the end of each round. These work great for using a different card for every tournament of the year.